I bleach my hair about every 6 months, to minimise drying and breakage of the hair, which means I have dark roots. 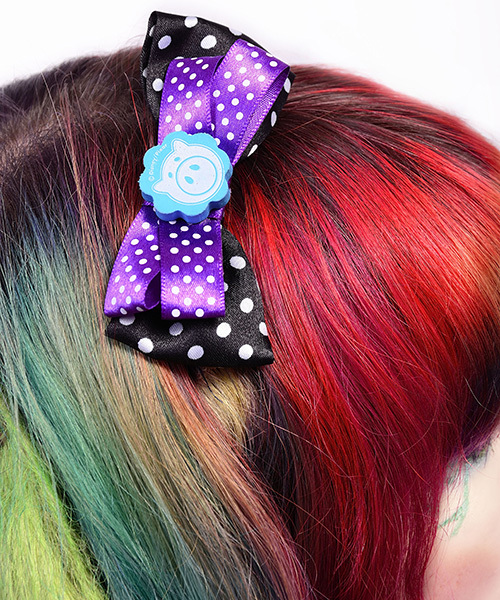 Hair accessories are GREAT for detracting attention away from your roots (or covering them up! ), and can be a great talking point. :) Some of the hair in these photos is actually clip-in extensions, which I find very useful, if I've had a hairdye "accident", where two colours have mixed together, obscuring the original colours. 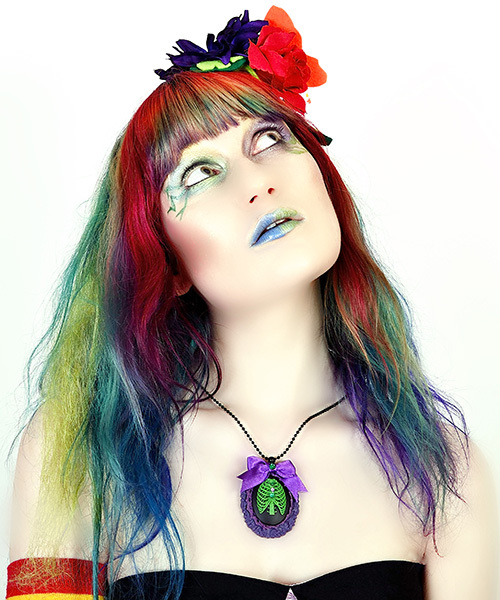 For example, the green area of hair in photo 4 is a clip-in extension that I used, as the green hairdye hadn't come out as brightly as I would have liked. 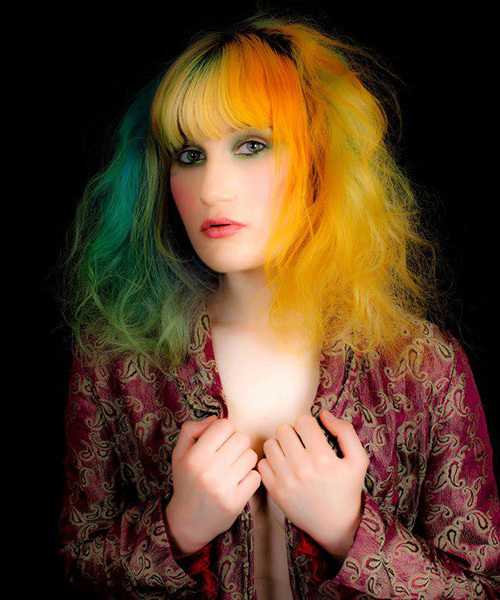 To create a "marbled" effect, with patches of colour, like in my fringe, use a small paintbrush to apply the colour. 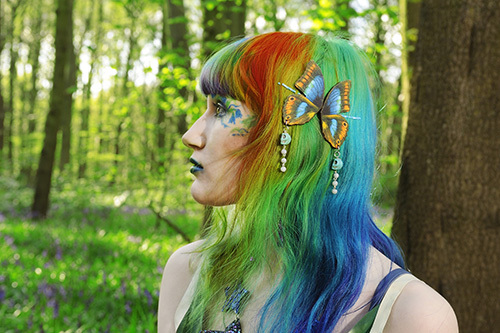 Faded hairdye can help you to create a new look, so its not always a bad thing! This two-tone hair was originally rainbow-coloured, but I liked the effect it gave as it faded, so I left it a while, before re-dying it. - Facial scrub and Simple face wipes are great for removing dye from the skin. - Vaseline around the hairline helps to stop the dye from sticking to your skin in the first place! 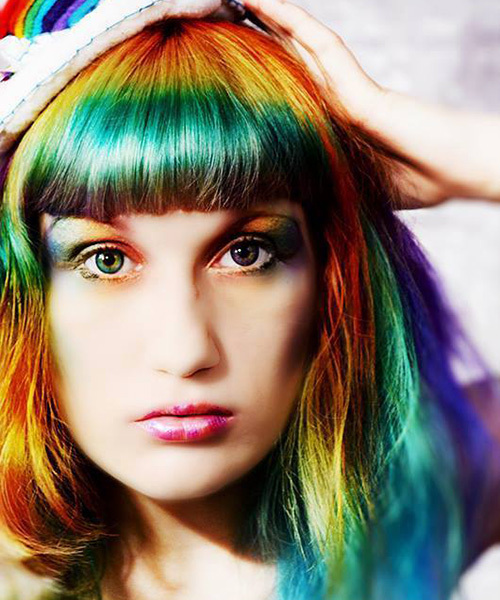 - If you want your hairdye to last as long as possible,avoid washing your hair every day. This is also better for your hair, and helps to stop it drying out. When you wash it, use cold or lukewarm water, as this dissolves the dye more slowly than hot water. - Wear a showercap over your hair, while the dye sets - the heat from your head helps the dye to set, and it also stops the dye from getting EVERYWHERE! - ......I think that's it! If you'd like to know anything else, do feel free to ask. :) Many thanks!